As an eighth grader at northwest Denver’s Centennial ECE-8 school a few years back, Evelyn Gomez demonstrated more of an affinity for career-focused learning than academics, a fact that was not lost on her teachers. So when it came time to choose a high school, they steered her toward CEC Early College, a 40-year-old career and technical education school housed in a fortress-like building a stone’s throw from downtown Denver. Gomez, now a 16-year-old high school junior, took to the program immediately. Since matriculating at CEC (which originally stood for Career Education Center), she has discovered a passion for entrepreneurship. Gomez’s best friend, Dominique Maes, 16, graduated from Skinner Middle School and followed her older brother to CEC Early College. Initially she wanted to pursue CEC’s renowned culinary track, where she would be able to work in the kitchen and dining room of the school’s restaurant, the Elliot Street Cafe, which is open to the public for inexpensive lunch on weekdays. But like, Gomez, she quickly found herself drawn to business, marketing and entrepreneurship, and her interest in the restaurant business faded. The same could be said for the 21 other career-track programs offered at CEC, ranging from welding to sports medicine, from computerized auto mechanics to computer programming, from fashion design to construction trades. It’s precisely that focused, self-motivating approach that makes the school a notable success when compared to other Denver high schools serving large numbers of low-income, minority students. There are about 430 full-time students in grades 9-12 at CEC, and another 320 who bus to CEC from other Denver high schools every afternoon to take career-focused classes not offered at their home schools. And ‘early college’ is more than a moniker. Students who stay at CEC for a fifth year can earn an Associate’s Degree through the Community College of Denver, at no cost to themselves. All CEC seniors and some juniors spend every morning at the Aurora Higher Education Campus downtown, taking classes at CCD. Just a few years ago the conventional wisdom in secondary education was that all students should graduate from high school and attend a four-year college, the holy grail of post-secondary life. Anything short of that was seen as akin to failure. More recently, the definition of a successful post-high school life has changed a bit. While providing all students with an education that prepares them for the option of four-year college is still an almost universal goal, paths that might not end at a bachelor’s degree are now widely viewed as viable and worthwhile. Increasingly, jobs that pay a living wage are available to students who earn an associate’s degree or a technical certificate. And pursuing those alternate paths does not close the door on students who eventually decide they want to pursue a four-year degree. It just gets them working for decent money sooner. During that college or bust era, CEC Early College churned along, much as it has since the mid-1970s, providing a diverse student body with a cornucopia of career-oriented education and training options. Today, CEC (which once stood for Career Education Center) produces about 100 high school graduates each year. Almost no one drops out and almost everyone graduates with a technical certificate or with enough college credits to send them well on their way toward an associate’s degree. Maes and Gomez are putting their business management training to good use. They are working to raise capital to start Paws Photography, a pet photography business. They applied for but didn’t get a $500 junior achievement grant, so they’re turning to a crowdsourcing Internet site to raise start-up funding. They figure just a few hundred bucks will get them a green screen, camera, and printer, which is all they need to get going. “This place makes you step outside your comfort zone,” Gomez said of CEC. But that’s not the only option the two girls are pursuing. Both plan to pursue Certified Nursing Assistant credentials, which would qualify them to work in hospitals and nursing homes. 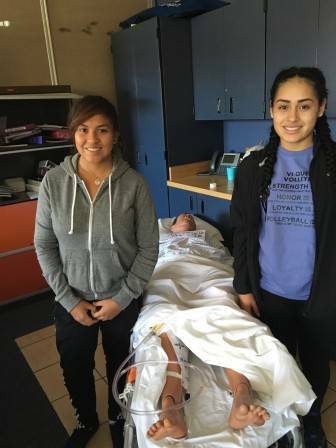 They hope to land nursing internships during their senior year while they take classes to prepare them for the Certified Nursing Assistant exam. Maes said she sees that as just a preliminary step to attending medical school and become a neurological surgeon. Gomez and Maes led a recent visitor through the school’s long, windowless hallways, where evidence of hands-on learning was everywhere. A group of students in a criminology class spoken into walkie-talkies as they investigated a mock hold-up. "Someone is robbing culinary, right? Over,” one girl barked into her radio. 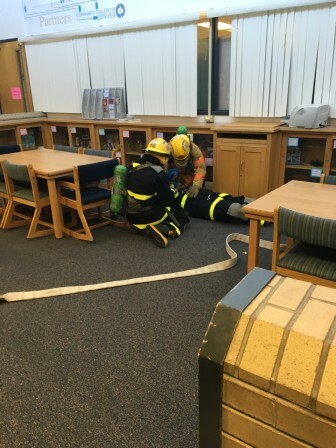 In an alcove near the main office, several students dressed in full firefighting regalia attended to a student playing at being overcome by smoke. Down the hall, in a video lab, Kevin Olives, a 15-year-old sophomore, used Final Cut Pro software to put the finishing touches to a music video about boyfriend-girlfriend domestic violence. Students are focused and driven, and teachers respond to that enthusiasm, students said. “I feel a closer connection with all my teachers here than I ever did at other schools,” Maes said. “The teachers seem more engaged here and care about our success. They go that extra mile,” Gomez said. Springer, CEC’s principal, has spent 11 years at the school in two stints, interrupted for years by a central office job that he couldn’t wait to leave to get back into the school. An unflappable sort, Springer’s sense of calm seems to pervade the school. “In my 11 years, I haven’t seen one single real fight here,” he said on a warm November morning. Students like Maes and Gomez are typical of CEC, in both their passion for pursuing careers and their enthusiasm about the school. School-wide data reflect the strong culture of connection between students and their course of study. CEC falls just short of receiving DPS’ highest School Performance Framework rating, blue, or distinguished. It hits that highest mark in most subcategories: student achievement, post-secondary readiness, enrollment, and student and parent engagement and satisfaction. Academic growth measures fall within the second highest (green, or “meets expectations”) category. The school does this with a student body that looks a like those at other, much lower-performing Denver high schools. Fully 86 percent of CEC students qualify for free or reduced-price lunch, a proxy for poverty. That same percentage of students is Hispanic, while 6.5 percent are white, 3.2 percent black and 2.8 percent Asian. Nearby North High School has similar student demographics to CEC but notably lower achievement. North has made major academic strides in the last few years, yet still ranks as a yellow school, “accredited on watch.” It does not hit blue on any measures, and green, or “meets expectations” on two: student growth over time and parent satisfaction. CEC staff pushes students to decide before the end of sophomore year whether they want to pursue a technical certificate or an associate’s degree. Those decisions aren’t final, but set students on a path. A significant number of students who choose the certificate route end up attending college, Springer said. Among the school’s 2014 graduates, 69 percent enrolled in a two- or four-year college, most of those two-year. Many of the remaining 31 percent stayed at CEC for a fifth year to attain an associate’s degree. “Only five to 10 kids didn’t go on” to some sort of higher education, Springer said. CEC students are carefully prepared for the college experience before they set foot on the Auraria campus. They’re coached on how to behave, study habits, and on not clumping together in ways would make them conspicuous. That’s a deliberate strategy, Springer said. And CEC kids have proved over time that they’re up to doing college-level work. Last year, 92 percent of CEC kids earned a passing grade in their college classes, compared to 74 percent of full-time CCD students.